HEATTEC supplies imported Ceramic Infrared Heaters. These are available in following sizes : 122 X 60, 245 X 60 Curve / Flat surface. 60 X 60 and 122 X 122 flat surface.These heaters are also available with insulation. 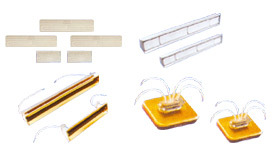 Available with Built in Thermocouple – “K”type (optional).